“Oh no, your mother wouldn’t like that,” he replied. “Very well,” he said. He had filled his pipe with tobacco as his daughter spoke. Now he lit it, took a good puff, and exhaled enough smoke to raise a sinister fog along the New England coast where his tale took place. “Now this story,” he began, “was told to me by my Grandfather Whitman when I was young. It dates back to the beginning of this century, and every word of it is true. It concerns a young man named Enoch, and Sabrina, the pretty young girl who had the misfortune to love him. They had grown up in the same little seaside town—known each other since birth in fact, and gone to school together—and when they came of age, they fell in love, and there was talk of their marrying. “Now Enoch was by no means a handsome boy, and he was not strong or athletic like most of the other young men, but he had a tall figure that stood out in a crowd, and his hard features suggested a determination not really there. Some say he had a little scar over his lip where his older brother had once struck him with a rock when he was a boy—I don’t know whether that’s true or not, since I was not there, but what is true—and you can verify this in the town’s records—is that his older brother went missing for several days, and when his body was found, it was lying on some rocks along a cliff above the sea. The townsfolk whispered that Enoch had murdered his brother to get revenge for that scar, but it’s just as likely his brother’s death was an accident and no fault of Enoch’s. “Sabrina paid no heed to any ill rumors about the young man. She had her heart set on Enoch, and he had his heart set on her, and none of their parents was opposed to the match. But that spring, Enoch’s mother and father both died of the diphtheria, and then that summer, a terrible drought struck. Now Enoch had been raised a farmer, but his father had done all the hard work on the farm, and with his parents no longer there to keep a steady eye on him, he did not care for the crops as he should. The long and the short of it is that his crops failed, and ultimately, he knew he could not make a go of the farm. Plenty of other farmers had a hard time that year, but they struggled and got by, while the determination that appeared on Enoch’s brow did not compensate for the weakness of his character and his lack of backbone. Finally, he confessed to Sabrina that he wanted nothing to do with hard dirty work like farming, so he was going to sell the farm and seek his fortune elsewhere. “Sabrina’s parents were beside themselves with dread when they heard this, for they did not know how Enoch would support their daughter. They had two sons of their own who were to split the farm between them, so Sabrina was expected to find a husband to care for her. When her parents considered breaking off the engagement, Sabrina flew into a fury, declaring if she could not marry Enoch, she would marry no man but throw herself off the same cliff that had caused the death of Enoch’s brother so the ocean would swallow her body for all time. “As you can imagine, Sabrina’s parents were frightened by her outburst, for they truly believed their daughter meant to destroy herself if they did not let her wed Enoch. They told themselves the boy was young and foolish, but he came from a good family, and in time, he would settle down; they would do what they could for the young couple in the meantime. “And so one day in early spring, Sabrina and Enoch were married, and a few weeks later, he went off to sea. He promised Sabrina he would make his fortune and come home with enough money to buy ten farms, or better yet, they might start up a tavern in the town, or even their own shipping business. Sabrina, because of the great love she bore for Enoch, allowed her soul to be fed on such dreams, while her parents worried their daughter and her unsteady husband would starve after they had gone to their reward. “Well, Enoch’s ship sailed off—out to the South Seas it was. The summer and the autumn passed and then the winter came. An entire year went by, and in that time, not one letter came home from Enoch. You can imagine Sabrina’s anxiety and excitement when the ship finally sailed back into the harbor, but I don’t think any of us can imagine her disappointment when all the other sailors disembarked from the ship, yet no Enoch appeared. “One young man on the ship was a couple of years older than Enoch and had known him since their schooldays. When Enoch’s brother had died, this young man had taken it upon himself to look after Enoch; it was said when one of the other boys at school had called Enoch a murderer because of his dead brother, this older boy had thrashed the accuser so hard no one else ever dared whisper such a rumor again. This young man was the last to come off the ship that day, and when he saw Sabrina standing on the dock, her eyes welling up with tears, he hated to be the one to tell her, but he felt it was his duty. “‘How?’ she demanded, for in her heart, Sabrina had begun to doubt Enoch’s fidelity. “Sabrina tried to find comfort in these words. She let the young man walk her home to her parents’ house, and there he told the same story again, and her family politely thanked him and then let him go home to his own folks. “They waited all that next spring, and that summer, and into the autumn, and when winter came again, and they knew no word could reach them in those months because of the storms at sea, all their spirits fell, and in her heart, Sabrina began to doubt Enoch would return—she feared he might have died—that’s what she told herself—that’s what she almost hoped had happened, for the other possibility would have been just too much for her to bear. “What do you mean by ‘gone native’?” Adele interrupted Mr. Whitman. “You mean with the savages?” asked one of the shopgirls. My sense of propriety at that moment made me want to get up and leave the room; I would have expected Mr. Whitman to have a better sense of decorum, but I also perversely found myself wanting to know what had happened to the poor Sabrina. “The brothers kept all these rumors from their sister,” Mr. Whitman said, “but I imagine some of the sailors told their own wives and fiancées, and you know how women talk, and so I’m sure if these rumors never actually reached Sabrina’s ears, she sensed the rest of the town knew Enoch had done something disgraceful, and her heart broke over it. “The years passed, and Sabrina’s parents died. Her brothers married and started families of their own, and they prospered enough to build their own homes while Sabrina continued to live alone in her parents’ house. Her brothers begged her to come live with them, but she refused. She could no longer find joy in human companionship. Her house was near the ocean, and so she had a widow’s walk built upon the roof, and they say in the evenings at dusk, she could be seen pacing about there; sometimes she would walk the entire night while the rest of the town slept, for she craved no human company save that of her Enoch, and he was absent. Those children who dared creep near the house at night to catch a glimpse of the mysterious solitary woman said they heard her weeping and begging God to bring back her lover. That is when the story began to grow truly strange. “The young man who had been Enoch’s friend had grown to love Sabrina, perhaps out of compassion for her pain, perhaps because he had always loved her, but he had been too loyal a friend to Enoch to speak earlier. Finally, he went to Sabrina and explained to her how unlikely it was that Enoch would ever return, that enough time had passed to presume Enoch was dead, and that if Sabrina would have him, he would be honored to marry her and care for her the rest of their days. “Sabrina thanked him, but she refused his offer. She continued to live in that house alone, and after a few years, the young man gave up waiting for her and married another. He became a good husband and father, but the townsfolk whispered it was always Sabrina whom he truly loved. “And then one night, many years after the day Enoch had sailed away, when Sabrina’s beauty had begun to fade, and she had shut herself up so that scarcely anyone ever saw her, the townsfolk heard a piercing scream coming from her house. When they ran and knocked on her door, there was no answer, but the screaming continued until finally, Sabrina’s brothers broke in through a window and went upstairs. They found their sister sitting up in bed, her hair turned gray overnight, her face pale with horror, blood soaking through all her bed sheets. She stood staring out the window, shrieking so that her brothers could barely stand it, and it took them several minutes before they could shake her enough to bring her to her senses. “Some said she had tried to kill herself—to slit her wrists—though her brothers refused to let a doctor see her. I don’t know why they didn’t send for the doctor, but people say it was because they were afraid to know the truth about what had happened to her; others say she had not hurt herself, for there was a woman who came to clean for her, and she told everyone she had seen no scars on Sabrina’s wrists the next day. “I hesitate to mention this part, but Sabrina was clearly mad after that night, such that her brothers ordered her tied to her bed so she would not hurt herself, and often she would thrash about in the bed, screaming out Enoch’s name. Most frightening of all, some say she went mad because her prayers had been answered—that Enoch had returned to her—only it was not the flesh and blood Enoch, but his ghost—come back to claim his wife in their bed. “Really, Father!” said Edna, but I could see a smirk of pleasure on her face. “Now, I’m only repeating the story the way my grandfather told it to me, and whether it is true, who is to say,” Mr. Whitman replied. “Anyway, after that, Sabrina grew weaker and weaker, and though she thrashed about in the bed for several more nights, soon she wasted away until she died before the year was out. “Her brothers boarded up the house after she died, for they could not bear to go near it, their pain was so great, and they were too sentimental to sell or tear down their childhood home. Everyone was silent after Mr. Whitman finished his tale. I thought it completely distasteful and wanted to go upstairs to bed all the more now except that Mrs. Whitman had still not come in with the pie and coffee. “Nathaniel, you and your ghosts,” Mrs. Whitman frowned. “What? It’s Halloween after all,” he said. I didn’t know quite what to expect in reading this book. I had only heard recently that authors were publishing e-books that contained just chapters or sections from books in a series. “Shudderville” fits that format, being the first of a six-part series of episodes, much like a serialized novel or connected TV episodes. I was interested in this book from its title, its episodic format, and because other reviewers had said it was scary. And I was not disappointed by any of that—okay, I admit the cliffhanger ending left me a bit disgruntled, but it fulfilled the author’s purpose in making me want to read more, which I did. Summarizing the plot is difficult because the story has so many twists in it. But I’ll tell what I can without giving too much away. Sophie is a young woman whose daughter Jayla was killed in a car accident when Sophie let her daughter’s father, Peter, take the child with him. When Sophie realized Peter was drunk, she tried to stop him, but it was too late—he took off with Jayla in the car, and soon they were both dead. Now Sophie is an alcoholic, severely depressed, and desperately wishing she could have her daughter back. Sophie begins to hear strange noises coming from the apartment of her new neighbor, a handsome young man with a goatee named Ryan. Her elderly neighbor, Mr. Mandelbaum, comes to complain about the noise, and in time, he starts to pry into Sophie’s personal life. 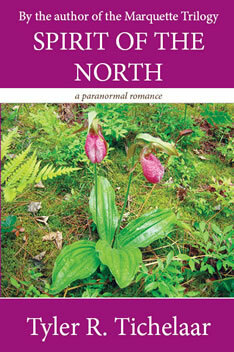 Sophie soon meets Ryan and her friend Cassie becomes sexually involved with him. I expected at this point for Ryan to be the cause of the novel’s shudders, but Zabrisky’s plot is far more complex. Several twists in this installment and a cliffhanger made me unable to resist going to read the second book in the series, and I thought that story even more suspenseful, although it contained different characters entirely, so not until the third installment can we expect the plot of part one to continue, and I expect in time it will connect with the plot from part two. I intend to keep reading. The first four installments are available now with the rest soon to come. A lot of reviewers have already commented on how scary this series is and compared it to “The Twilight Zone” (one of my favorite TV shows). The comparison is warranted, but I didn’t find the story scary so much as suspenseful and intriguing. It does not have the sensational or gory moments I have come to expect in horror novels; rather it is more literary in its themes and attached to the classic Gothic literature tradition, but definitely written for a modern audience. Zabrisky’s writing style is modern and easy to read. Perhaps some of it is a bitclichéd, particularly in the dialogue, but only because she is writing realistic dialogue—people talk in clichés all the time. She does have some imaginative language—my favorite line came when Sophia was watching a television show about polar bears where she thought they looked cuddly but realized “A child was like a Pop-Tart to them.” Her second installment felt smoother and more haunting in its language and tone. 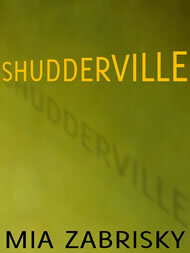 But what I enjoyed most about “Shudderville: One” was Zabrisky’s use of universal and especially Gothic themes that go back to classic eighteenth and nineteenth century Gothic literature, such as Matthew Lewis’ “The Monk” and William Godwin’s “St. Leon.” Here is the quest for forbidden knowledge, and much like in Goethe’s “Faust,” a signing away of one’s soul for what one desires; the punishment that results, however, is closer to “The Twilight Zone” in its twists. The Gothic quest for immortality is here and more relevant than ever in an age when the media and advertising are constantly trying to make us obsessed with retaining youth. A character in “Shudderville: One” reminds us that the cost of immortality is watching everyone you love die around you so you are alone in the world. For the low price of $1.99, this first installment of the Shudderville series is well worth reading to decide for yourself whether you will enjoy it. It’s better than most of the television series out there today, and fast-paced, full of surprises, and suspenseful without cheap sensations of horror and gore. I was left wanting more, and I think most readers will feel the same. L. Frank Baum, best known as author of The Wonderful Wizard of Oz and its many sequels, may seem unlikely as a Gothic author, but he was heavily influenced by the Gothic (and fairy tale) traditions, as evidenced by his wicked witches of Oz, among other characters. Baum wanted to create fairy tales that were not scary, although anyone who saw the film The Wizard of Oz (1939) as a child knows just how scary Margaret Hamilton was as the Wicked Witch of the West. Nevertheless, there is a benevolent sense that all will turn out for the best and good will triumph over evil that pervades the comic world of Oz. Since I was eight years old, I have been a fan of Baum’s fourteen Oz books and have read almost all the other books as well that he wrote. The Oz books, more than probably any other books, are my constant source of comfort whenever I need escapism and I still go back and reread them over and over. Recently, I reread The Tin Woodman of Oz (1918), the twelfth book in the series, and the one I have often thought the least interesting, but this time, after having worked so long on writing my book The Gothic Wanderer, I am more aware of Gothic elements in other works and was surprisingly engrossed by this book’s Gothic themes. It might be a stretch to say the book is Gothic, but it does introduce a young boy named Woot the Wanderer, more a romantic than Gothic wanderer, but a wanderer nonetheless. There is also a giant Yookoohoo (an enchantress who does transformations), Mrs. Yoop, who turns Woot, The Tin Woodman, and their companions into various animals, and there is the Lonesome Duck, quite the melancholy and isolated Gothic character. But most Gothic of all is Chopfyt, Baum’s own version of the Frankenstein Monster. In The Wonderful Wizard of Oz, the Tin Woodman recounts how he was in love with Nimmie Amee, but the Wicked Witch of the East disapproved of the relationship and enchanted his ax so that he cut off his various body parts. He took these to Ku-Klip, the tinsmith, who then kept the arm or leg, etc. and made the Tin Woodman a new one out of tin until eventually he was completely made of tin. At the beginning of The Tin Woodman of Oz, the Tin Woodman decides he will find Nimmie Amee and ask her to marry him after all these years. After many adventures, the Tin Woodman and his friends meet the Tin Soldier, who had fallen in love with Nimmie Amee after the Tin Woodman. He had a similar experience and ended up made completely of tin as well. Together, these two tin men and their companions arrive at the tinsmith’s shop to inquire whether Ku-Klip knows where Nimmie Amee now lives. Seeing that Ku-Klip is not home, they look about the shop, and before long, they find their arms and legs in pickled water, and horror of horrors, the Tin Woodman finds his own head staring back at him and it talks. Because it is separated from the rest of its body, including its heart, the head is not overly intelligent or polite. 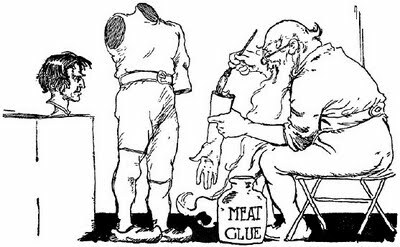 Nevertheless, no one can die in Oz, so a talking head sits on a shelf in the tinsmith’s shop, alive for all time. It is a shocking moment in the novel, and quite an uncomfortable and disturbing one, but not as disturbing as what comes next. Ku-Klip returns, and when asked what he did with the Tin Soldier’s head, he confesses that he took the best pieces of both tin men’s original bodies and created from them Chopfyt, whose name is a compilation of the Tin Woodman’s real name Nick Chopper and the Tin Soldier’s name Captain Fyter. The tinsmith now tells them where Nimmie Amee lives so the two tin men go to find her, agreeing they will abide by her decision which of them she’ll have. But horror of horrors, they find she is now married to Chopfyt, who resembles the two of them and even has a tin arm of his own. In Mary Shelley’s Frankenstein, one of the most terrifying moments is when the Monster demands that Victor Frankenstein create a female mate for him. At first, Victor begins to create such a female monster, but then he realizes these monsters could ultimately breed a race of monsters who will conquer the human race, so he destroys the female monster before it is brought to life. In revenge, the Monster kills Victor’s bride, Elizabeth, on their wedding night. Baum reverses this scene, not having the Monster kill the bride, but instead marry her, and she even prefers the Monster. 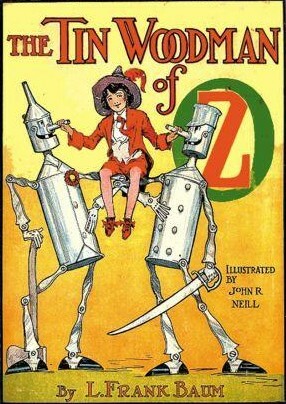 Both the Tin Soldier and the Tin Woodman offer themselves to Nimee Amee, but she tells them she will keep Chopfyt rather than having to scold and chide a new husband into knowing her ways, and while Chopfyt is not “agreeable”—Woot later says he’s a total “grouch”—she will stick with her monster man. If readers feel my comparisons between Baum’s Oz character, Chopfyt, and Mary Shelley’s Frankenstein monster are a stretch, I should point out that Baum also created the Patchwork Girl of Oz, a woman without human anatomy in her creation, but one who inspired Shelley Jackson’s 1995 hypertext novel Patchwork Girl, which is based on both The Patchwork Girl of Oz (1913) and Mary Shelley’s Frankenstein (1818). I do not know whether L. Frank Baum ever read Frankenstein, and the novel was not as popular during his lifetime as it was later in the twentieth century when it became part of popular culture because of its film versions, but doubtless, he was an innovative author able to capitalize on terrifying themes and turn them into benign and comical, if still, disturbing Gothic moments, in his novels. Like Shelley’s, Baum’s imagination knew few boundaries.